The following is the continuation of a series of profiles on Loyola philosophy graduate students, giving you a brief sense of their thoughts on their research, teaching, and the value of philosophy. This profile covers Clinton Neptune. 1. What made you become a philosopher? I started college as a pre-med student and my program required an ethics class. Shortly into the course, I found myself completely enamored with the reading and discussion of philosophy. I credit my professor, Dr. Michael Byron, whose skill and passion lit a fire in me that has continued to burn for the past decade. I was deeply blessed to have such great teachers and I wanted to follow in their footsteps – teaching others this marvelous content and hopefully modeling a winsome philosophical life. 2. What is the topic of your dissertation? What made you become interested in this topic? My dissertation offers an alternative to prevailing assumptions in philosophy religion concerning certain conceptions of God. I argue that we ought, for the purpose of inquiry into God’s existence and nature, to think of God as a being that is willing and able to rescue humanity from their predicament of death, moral failure, and suffering. Other prominent ways of thinking about God’s existence frontload the conversation with several confusing and complicated properties of God that can serve as stumbling blocks to religious inquiry. For example, ascribing the property of exhaustive foreknowledge to God is quite challenging to defend and, in my opinion, is not a central property of God that must be endorsed at the outset when searching for evidence of God’s existence. I think it is an intellectual barrier to potential salient evidence. Paul Moser’s work in religious epistemology has been enormously influential for me. His work caused me to seriously rethink the project of Natural Theology. I found myself relying on the power of the traditional arguments for God’s existence when discussing my religious belief with others—arguments like the cosmological, teleological, and ontological arguments. Now I view them as a bit misguided and ultimately wanting as an explanation or defense of my religious beliefs. Moser’s focus instead on the evidential value of religious experience and God’s hiddenness has reshaped the core of my philosophy of religion. 3. How have you found the writing process? Are there any tips you would recommend for other graduate students to follow? For me, the most important marker of success in my writing process is simply the discipline to set aside a set amount of time each day to work on it. I started using Google calendar to intentionally carve out two hours in the morning to write. A mental hurdle you have to jump is the thought, “I don’t have to work on it today.” It’s tough because that sentence is true of every day from start to finish – not working on it a single day will not wreck the project entirely. But, of course, if you never work on it, it will never get done! One tip that has worked well for me is doing a bit of exercise before my writing time. I try to get up early, run for two miles, and then sit down to write at my local coffee shop. I think it helps your mindset going into the writing session when you have already accomplished something of value that day – keep that production train rolling! 4. You’re currently in a non-academic position. How have you found that your philosophical training can contribute to work outside the academy? I currently work at Heartland Community Church in Medina, OH as their Connections Director. I am tasked with providing support and leadership to ways folks can live in community with one another. I have found that people, like myself in that first philosophy class, are hungry for what philosophy can offer even if they don’t say it or know it. I have meetings every week with people that want to dig deeper into the realm of ideas, and it has been good to see how clear thinking in the context of relationship can be transformative. 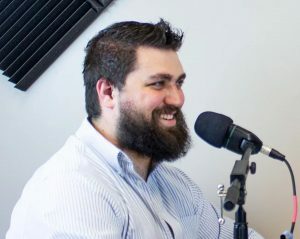 A fellow philosophy-lover and I started a podcast called Open to Truth where we discuss theology and philosophy that is accessible for folks in the church without formal philosophical training. You can find it on iTunes, Spotify, and our website: www.opentotruthpodcast.com. Opportunities to serve my community with my specific training have been surprising and satisfying. 5. Are there any pieces of advice that you wish you had known earlier on in your philosophical career? I had been acquainted with many of the typical warnings you hear about the job market. One that I did not fully appreciate and greatly influenced my decision to go non-academic, was the idea that one might not have very much control over where one could secure a tenure-track position. It has been increasingly important for my wife and two kids (and one on the way!) to live near close friends and family. This was simply not as important to me when I first started, and I suppose I failed to think carefully about how my attitude would change on this in the future. 6. Are there two or three sources–I’m thinking books and articles mostly, but feel free to include any other sources if you want–that you would recommend for thinking about your area of research and why? I just finished reading What is the Bible: How an Ancient Library of Poems, Letters, and Stories Can Transform the Way You Think and Feel About Everything by Rob Bell. It is an engaging, easy read and towards the end draws some fascinating implications concerning topics in philosophy of religion such as inspiration, divine revelation, and evidence for divine activity. I am eager to get my hands on the Pascal’s Wager, a collection of essay Paul Bartha and Lawrence Pasternack. It will pay homage to the ways Pascal’s argument has influenced the history of philosophy and decision theory while spending some time offering contemporary analyses of its validity. It should be a hoot! The following is the first in a series of profiles on Loyola philosophy graduate students, giving you a brief sense of their thoughts on their research, teaching, and the value of philosophy. This first profile is on Jacob Andrews, who specializes in medieval philosophy and philosophy of religion. Growing up in a household of faith was definitely the biggest influence. It has always been normal for me to suppose that (1) the most important questions a person can ask are the kinds of fundamental questions asked in philosophy and religion, (2) these questions are distinct from the matter of fact questions studied in other disciplines, (3) some of the best answers to these questions are found in books. 2. What is your dissertation about? My dissertation is on the relation between religious faith and philosophy in William of Auxerre (1156-1231). Lots of people ask whether there is good non-religious evidence for God’s existence (as well as more particular doctrines, like the Incarnation, etc.). Suppose there was such evidence. Wouldn’t having proof or strong evidence for a religious belief make it hard or impossible to have faith in that belief? It seems difficult to say that you can believe some proposition on the basis of faith or trust in someone while also knowing for yourself that that proposition is true. But William says that you can have faith and natural knowledge simultaneously, and my dissertation explores his reasons for thinking so. 3. What has surprised you most during the process of writing your dissertation? Has writing this dissertation substantially changed your opinions? Are there any arguments or philosophical figures that you came to appreciate more as you went along, or any arguments that you are more skeptical of now than when you started? Several times I have found William or other writers making a distinction or pioneering a concept or argument in order to solve a theological problem, and the distinction or concept ends up enriching, challenging, or changing my purely philosophical thought. William is talking about whether it’s permissible for Christian theologians to give proofs for God and the Trinity, but he ends up with valuable insights into the nature of trust and belief in general. William’s religious epistemology is complicated for me. It is an odd blend of intellectualism (prizing rational argument above religious faith) and what seems a times like fideism (rejecting rational argument and evidence as inappropriate for or dangerous to religious faith). He thinks that faith is a kind of perception of God, such that someone with proper Christian faith really knows that Christian doctrine is true, and so must refuse to rely on any other evidence (he’s rather Kierkegaardian in this regard, and both are accused of fideism for this reason- I think falsely). On the other hand, precisely because faith is knowledge, other forms of knowledge present no danger to it: someone who already relies on their faith that God exists and is triune, can also merely possess rational arguments for these doctrines, while still having faith that those doctrines are true. William seems to think that having some argument or evidence Z that justifies belief in P is not the same as actually believing in P on the basis of Z. For example, I have ample justification for believing that the Leuven is a city in Belgium on that basis of testimony (of friends, professors, Wikipedia, etc.). But I do not actually believe that Leuven is in Belgium on that basis: I believe it because I lived there once. Likewise, someone could possess a sound and valid argument for God’s existence, but nevertheless believe that God exists on the basis of faith. I remain attracted to this view of faith, which gives maximum power to both the radical commitment of religious faith and the God-given expansiveness of human reason. It seems superior to the view of Aquinas, who thinks that faith is not a form of knowledge, but a supposition which requires an act of the will to push the intellect toward certainty. But recently I have become more appreciative of Aquinas’ position. There are important phenomenological features of faith- personal trust in God, the ability to waver and doubt while still believing- that are difficult to explain on William’s account, but easy on Aquinas’. 4. How have you found the writing process? Are there any tips you would recommend for other graduate students to follow? 1. Write every day. I mean new philosophical prose, not just notes or editing, even if it’s just especially polished freewriting or a blog post. Get in the habit of articulating your thoughts to an actual or potential public. 2. Keep a steady pace. There will be seasons when you can write like a madman all day long. As hard as it is when you’re coming up on a deadline, resist those urges, lest you end up the next day with nothing to write and kill your habit. Once you hit your word goal for a day, work on outlining the next day’s work, so that you can jump right into writing the next day. 3. Read philosophers who write well. As a newbie writer, I’m a big mimic. If I’m reading Plantinga or Zhuangzi or Hume, I’ll start to write like Plantinga or Zhuangzi or Hume. Unfortunately, that means that if I’m reading a poor writer, I’ll write like them, too. You can’t avoid bad writers, but you can regularly refresh your palette with good ones. 4. Reward yourself. The kind of work we’re in doesn’t generate automatic rewards: it’s a long path, sometimes years, from conceiving an idea to publishing an article. You don’t even get the satisfaction of clocking out of a shift! To keep yourself going, set concrete goals between starting and finishing and reward yourself for meeting those goals. 5. You’ve had some experience with teaching. What topic have you found most interesting to teach, and why? What have you found to be the most difficult aspect of teaching, and how have you tried to address that? Logic is just fascinating to me, and I enjoy teaching it in any class. I love showing students how a little bit of skill in logic can illuminate so many practical and theoretical problems. If, at the end of every semester, one student comes away knowing how to find and correct flaws in their own thought, or how to locate fundamental disagreements and discuss those rather than yelling at or talking past their opponents, I have done my job. The most difficult is also the most important: getting my students to really see what philosophy is; to get behind matters of fact and to see fundamental questions; to see why it is vital that they do so, to impress on them their duty and privilege as human beings to seek and hold onto truth. It isn’t that they’re opposed to this line of thinking; they just haven’t even considered it, and their environment conditions them against considering it. How do I do counteract this? Currently, I’m teaching ethics, with an emphasis on classical Chinese ethics. I began the first session with a little talk on relativism and skepticism; it’s important that I empower my students to imagine that they really can discover truth for themselves. I try, as much as possible, to apply the theories we’re studying to situations my students may actually encounter, especially to universal human experiences of family loyalty, friendship, death, etc. And I always make a point of including material from non-contemporary and non-Western sources, to show students that philosophical questions are perennial human questions, not just Western or modern ones. 6. Are there any pieces of advice that you wish you had known earlier on in your philosophical career? 1. Treat your graduate work like a 9 to 5 job. Commit to 7-8 hours a day, at least, of real philosophical work: close reading and careful writing. Keep a log or homespun timecard, if that sort of thing helps you (it helps me). 2. Use the flexibility of an academic career to your advantage. 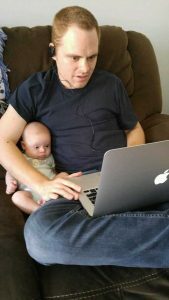 Setting my own schedule is a pain, and a great temptation to laziness; but it means that I can provide childcare for my son while my wife works. I can have a long lunch with my grandmother and work after dinner to make up for it. I can decide for myself what times of day are most productive for writing, and make sure that my schedule is clear at those times. Don’t overcommit, but use what you’ve been given. 3. Try to unify your research interests. Once you find your avenue of dissertation research, however vague, bend all your work toward it. Keep your conference papers on that topic. Wrestle all your term papers into its mold. Be like Confucius, whose work “could be strung together on a single thread” (Analects 4.15). 4. Read widely. Get grounded in the philosophical tradition by reading widely in different eras, cultures, and subdisciplines. Make a discipline of reading off-topic philosophy. If I hadn’t taken an unproductive detour into Chinese thought a few years ago, I wouldn’t be teaching the class I am today! 5. Stick to primary texts.The philosophical classics of any culture are generally easier to understand and more profound than the newest articles. If you have to choose between reading Aquinas and reading about Aquinas, just read Aquinas. 7. Are there two or three sources that you would recommend for thinking about your area of research, and why? Alvin Plantinga, Warranted Christian Belief. An accessible introduction to what’s at stake in religious epistemology. In particular, he does an excellent job exposing and exorcising the intellectual bogeymen that often attend modern inquirers (religious or not) into questions about God and religion. St. Thomas Aquinas, Summa Contra Gentiles. The discursive style is more palatable for modern readers than the quaestio format of his other, more famous Summa. Chapters 3-8 of Book 1 give a quick and dirty explanation of the need for divine revelation and its compatibility with natural reason. Star Trek: Deep Space Nine. The film and TV industry never seems to get the experience of religious people. But DS9 comes close. A normal, secular Starfleet commander is declared the messiah of an alien religion. He wants nothing to do with it- but then he meets their gods. In particular I’d recommend the following episodes: 3×15 “Destiny,” 5×10 “Rapture” (despite a truly awful conversation about faith- you’ll know it when you see it), 7×09 “Covenant.” But you really should just watch the whole show, which isn’t even mostly about religion. Jacob working with his son, Ivan. Ethical debates about migration concern a number of reasonable disagreements over whether—and the extent to which—political communities have the right to enforce their borders. What is hardly ever in doubt, even among those who support the “right to exclude” (at least those who defend the right on moral terms), is that there are limits to a political community’s exercise of this right: states cannot use force against those seeking asylum or basic human rights protection, and some means of policing borders are morally unacceptable. Although I am skeptical of arguments in defense of the right to exclude, here, I will assume that a convincing argument can be given. On this assumption, I will evaluate the Trump administration’s current zero-tolerance migration policy, which entails the separation of migrant children from their parents. I raise two moral objections to the policy, though this is certainly not an exhaustive list. First, I argue that the policy interferes with the United States’ duties to foreigners suffering human rights deprivations. Secondly, I argue that the policy—subjecting children to trauma as a means of deterrence—is an impermissible means of enforcing what may be an otherwise legitimate goal. The ends do not always justify the means, especially when children are involved. Read the entire article on the Ethics and International Affairs website. 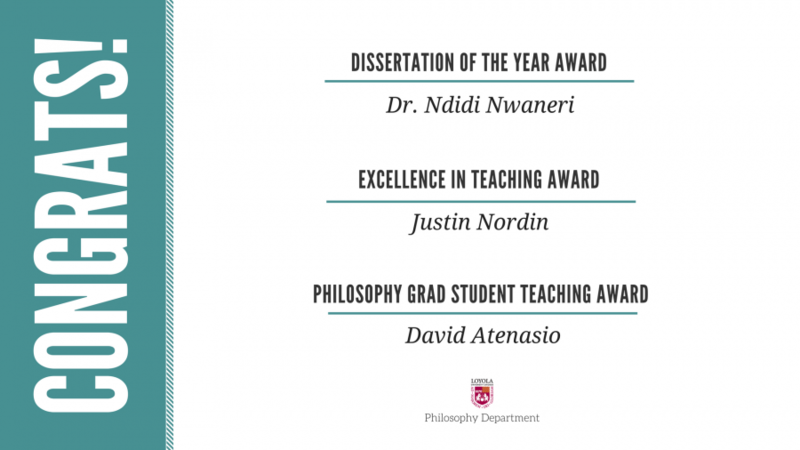 Congratulations to Dr. Ndidi Nwaneri, Justin Nordin, and David Atenasio for their awards this year! Dr. Ndidi Nwaneri was awarded the Dissertation of the Year in Humanities Award and Justin Nordin was awarded the Excellence in Teaching Award, both from the Graduate School. David Atenasio was awarded the Philosophy Graduate Student Teaching Award from the Philosophy Department. 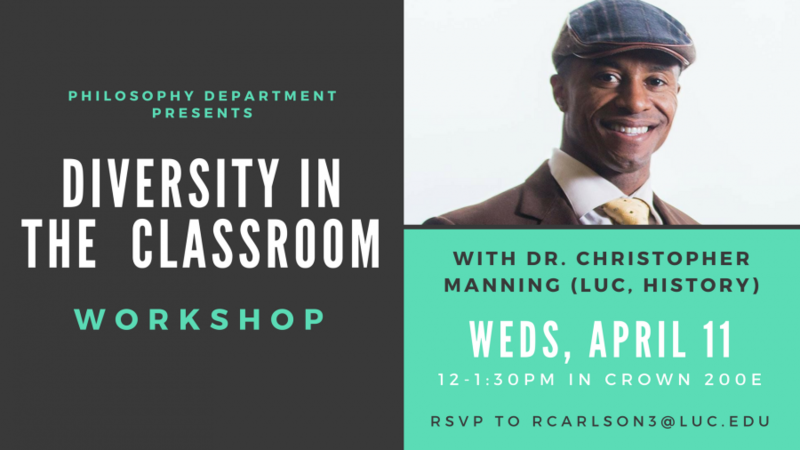 The Philosophy Department is hosting a lunchtime workshop with Dr. Christopher Manning on diversity issues in the classroom. Whether it’s how to get students to have productive conversations about race or gender in the classroom, or how to rebuild the classroom dynamic when you misgender one of your students, there’s a bunch of things we can all learn about to become more effective teachers. Lunch will be served! Workshop is Wednesday April 11, 12-1:30 PM in Crown 200 East (2nd floor of Crown, across from the auditorium). This event is intended for Loyola graduate students and faculty. Please RSVP to Jay Carlson (rcarlson3@luc.edu). 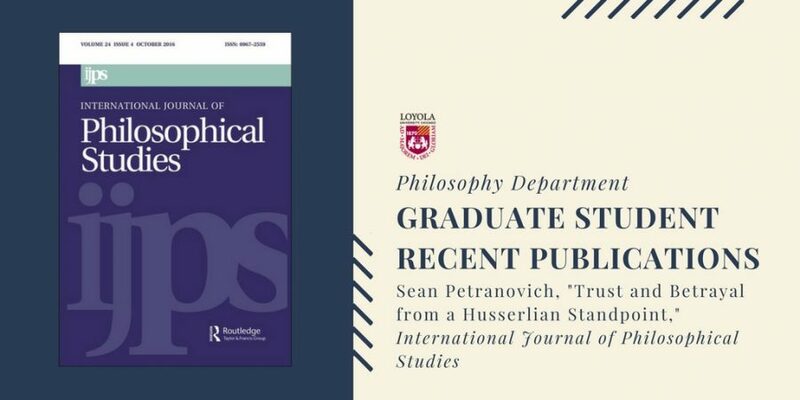 This paper provides an interpretation of trust and betrayal within political communities from the perspective of Husserl’s concept of social communities. I situate the paper amidst Margaret Gilbert’s theory of political obligations, arguing that at least one outside conception of trust fills a gap left in her theory. More specifically, I argue for the supplementary fit that Karen Jones’s conception of trust understood as ‘basal security’ provides for Gilbert. From there, I tie this conception of trust and betrayal to Husserl’s notions of ‘original belief’ and socio-cultural crisis. There is thereby a phenomenological elucidation of features within the social world that allow such crises to occur in the first place. Tomorrow: two events in the Philosophy Department! The Philosophy Department’s History of Philosophy Roundtable (HOPR) presents Peter Rosa (LUC), “A Mereological Reading of Spinoza’s Metaphysic” at 2:35! Please note the format of this roundtable: A draft of the presenter’s work will be circulated around one week ahead of the roundtable. During the first 10-15 minutes of the meeting, the presenter will situate the project of the paper in its research context and suggest directions for helpful feedback. The remaining hour will then be a discussion based on the attendees’ reading of the draft, along the lines suggested by the presenter. For more information and to be added to the HOPR e-mail list, please e-mail Peter Hartman (phartman@luc.edu) or Kristen Irwin (kirwin@luc.edu). The Phenomenology Research Group (PRG) presents Kay Park (LUC), “Sellars and McDowell on Kant’s conception of sensation” at 4:00! McDowell follows Sellars’s suggestion that intuitions should be construed as conceptual representations in Kant’s dominant usage of the term. For Kant often construes an intuition as a representation of an individual object, and takes such a representation to be the result of the synthesis of the productive imagination which follows the rules derived from the concepts of the understanding. However, McDowell disagrees with Sellars’s interpretation of the notion of sensation which Kant characterizes as the matter of an empirical intuition. First, while Sellars argues that Kant implicitly presupposes the existence of sensations which do not involve the synthesis of the productive imagination, McDowell argues that such a postulation of the non-conceptual cannot be attributed to Kant. Second, while Sellars argues that the postulation of the non-conceptual representations of sheer receptivity is necessary in order to make the receptive aspects of our perceptual experience intelligible, McDowell argues that the receptive or non-discursive aspects of our perceptual experience can and should be explained in terms of the conceptual capacities operating in our empirical intuitions. In this paper, I defend Wilfrid Sellars’s suggestions against McDowell’s conceptualist reading of Kant. First, I argue that Kant presupposes the existence of sensation which is not structured in terms of spatiotemporal intuitions through the analysis of Kant’s theories of intensive magnitude and transcendental reflection. Second, although McDowell’s conceptualist approach of an intuition attempts to secure the receptive aspects of our sensory intuition by characterizing it as comprising a non-discursive content, I argue that a conceptual content which is not discursive cannot be conceived. 3-22-2018 | Comments Off on Tomorrow: two events in the Philosophy Department! From his UAB page: Gregory Pence studied applied ethics with famous ethicist Peter Singer at NYU and helped found the new field of bioethics. For 34 years he taught a required, graded course to 200 medical students at UAB. Between 1984-1985 he chaired the Board of Directors at Birmingham AIDS Outreach, and from 1985 to 1995 the UAB Speakers Committee. The Publisher of The Review of Metaphysics, the Philosophy Education Society, Inc., announces its annual Dissertation Essay Competition. The competition is open to all participants who have been awarded the Ph.D. degree in philosophy in the United States or Canada during 2017. Entries must be either a chapter from a dissertation or an essay based directly upon a dissertation. Essays may be on any topic dealt with in the dissertation. Essays will be judged anonymously. The author of the prize-winning essay will receive $500. It is expected that the winning essay will be published in The Review of Metaphysics. Essays should be no more than twenty-five double-spaced typewritten pages and should be submitted in triplicate. Essays should be free of all identifying marks, both in the body of the paper and in the footnotes. Entries should be accompanied by a letter indicating the author’s name, the university from which his or her degree was received, and the title of the dissertation from which the essay was taken. Entrants who would like their manuscripts returned should also send a stamped return envelope of suitable size. On matters of style and form, The Chicago Manual of Style and a recent issue of The Review of Metaphysics should be consulted. A style sheet is available upon request and on the Review’s website. Additional inquiries concerning the competition may be directed to mail@reviewofmetaphysics.org. The results of the competition will be announced by 30 June 2018. Add us on Facebook and Twitter! If you have upcoming events or would like to share relevant articles on our social media sites or this blog, feel free to email them to this semester’s Outreach and Communications graduate assistant, Rebecca Valeriano-Flores (mvalerianoflores@luc.edu). 2-16-2018 | Comments Off on Visit our social media sites! It is well known that in Ideen 1, Husserl drops the ‘act-content-object’ schema in favor of ‘noesis-noema.’ But just what are these schemata for? Both are attempted answers to the question, ‘How must the world be such that one’s state of subjectivity counts as being of or about anything?’ Such schemata, then, are ontological: they describe the way the world must be. But they are also logical in the sense that interests Husserl from beginning to end: they describe not the law of inference (formal validity), but the law of thought or thinkability per se (objective validity). This identity of ontology and logic is what Kant and the German Idealists take the subject-matter of philosophy to be, whose successful clarification as such would allow philosophy in the modern era to begin. ‘Idealism’ is their name for that clarification. Husserl understands his idealism in this sense, too. He differs, though, in holding perception’s (not judgment’s) form of self-consciousness as the source of logical form, i.e., of thinkability or objectivity. His commitment to that difference is constitutive of his shift to noesis-noema as the schema expressive of philosophy’s proper subject-matter. 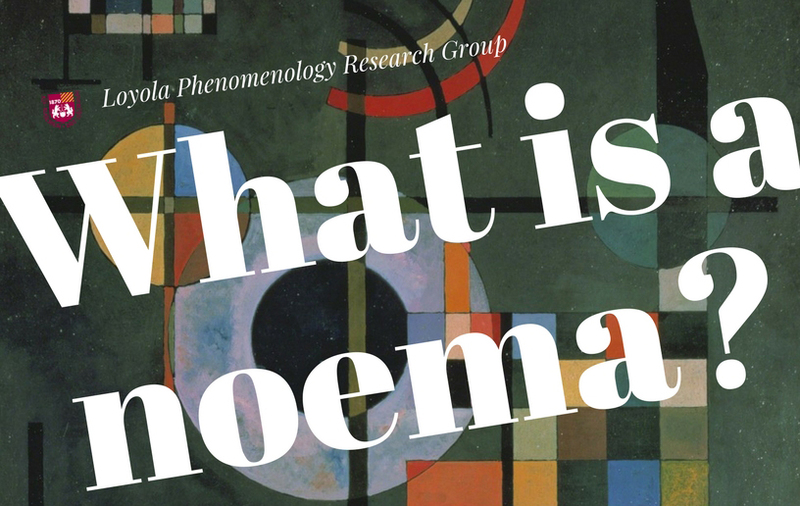 In this paper, I offer first steps towards elucidating that schema in the above-mentioned way, starting with ‘noema.’ I argue that a noema is the objectivity of an object, i.e., its apparent unity, and that since ‘noema’ replaces the ‘content/object’ distinction, Husserl therewith espouses a no-content view of intentionality. The event will take place on February 23, 3:30 to 5:30 PM in Cuneo Hall 212. 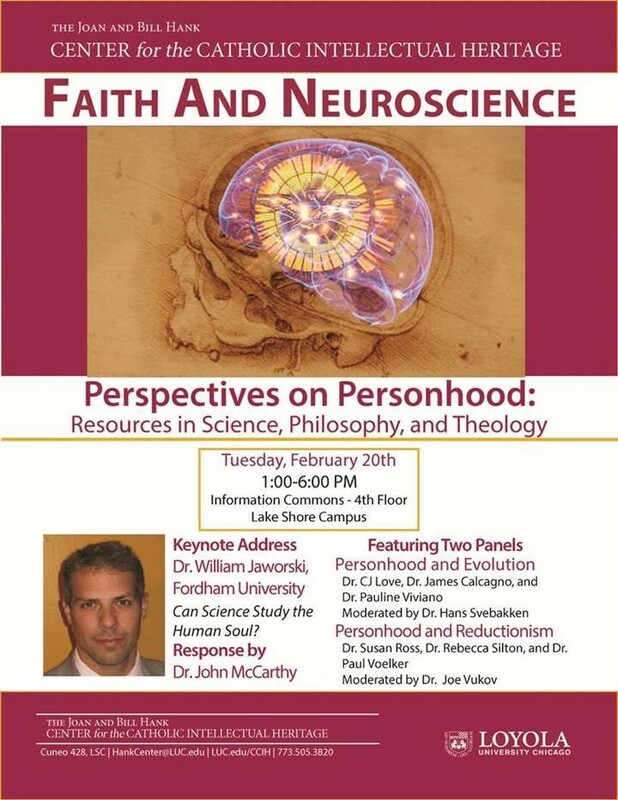 Loyola’s Center for Catholic Intellectual Heritage presents Perspectives on Personhood, a conference taking place on our Lakeshore campus next Tuesday! Today! 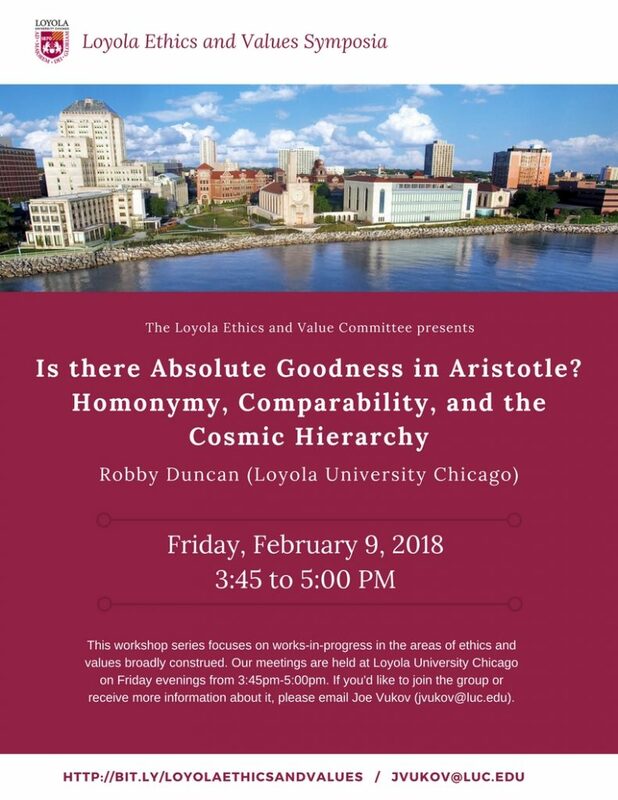 Robby Duncan will discuss Aristotle at the Ethics and Values Symposia today at 3:45. Email Joe Vukov (jvukov@luc.edu) for more information. 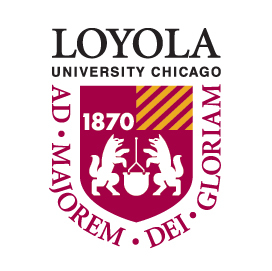 CFP: International Social Theory Consortium at Loyola! Loyola is hosting the 17th Annual Conference of the International Social Theory Consortium! This year’s theme is “Modernity Between the Damaged Life and Sane Society: Social Theory in the Age of Urgency.” This event will be held May 17-19. Email your abstracts and session proposals to istc2018@socialtheory.org no later than March 15th. Find more information on the ITSC website. Download a PDF of the full CFP here: International Social Theory Conference CFP. 2-07-2018 | Comments Off on CFP: International Social Theory Consortium at Loyola!